IMPORTANT! The versions of PhoenixMiner before 4.0 only support DAG epoch up to 235. Both ETC and ETH passed DAG epoch 235 some time ago. The unfortunate result is that the old version(s) of PhoenixMiner won't be able to create DAG or mine ETH or ETC any more - you must upgrade to PhoenixMiner 4.x if you are mining ETH or ETC. • Added new Nvidia kernels v3 with slightly higher hashrate and lower power consumption (up to about 1-1.5% less power). The new kernels are supported only on GTX1050/1060/1070/1080/Ti GPUs and are enabled by default on these GPUs. Note that you can't use these kernels for dual-mining, only -nvkernel 2 works for dual mining on Nvidia. • Added new command-line option -nvkernel to select the old (v1 CUDA kernels from PhoenixMiner 3.5), newer (v2 introduced with PhoenixMiner 4.0), or the latest CUDA kernels (v3). The possible values are 0 (auto; the default, selects the best kernel for each GPU), 1 , 2, or 3 (forces v1, v2, or v3 kernels respectively). Note that only v2 CUDA kernels support dual mining. 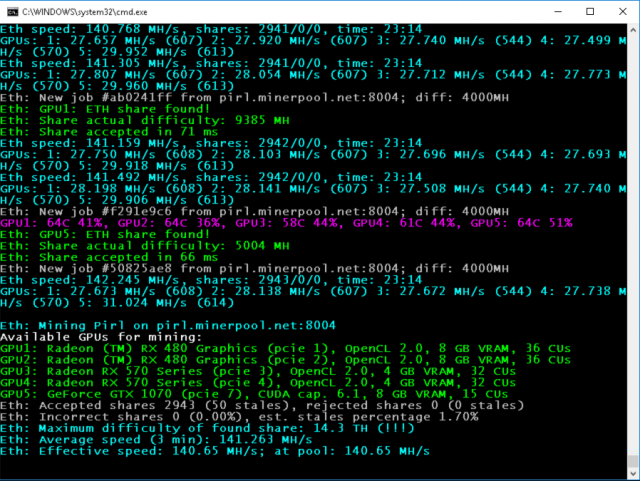 • Added experimental support for ProgPOW mining of Bitcoin Interest (BCI). Note that the kernels are not optimized and only work on AMD. You must add -coin bci to the command line (or COIN: bci to your epools.txt file) in order to mine BCI. • Added parameter to enable or disable driver-specific optimizations on Nvidia GPUs. Use -nvdo 1 (the default is 0) to enable the optimizations. This won't change hashrate (or will change it only slightly) but can make the cards more stable depending on the concrete Nvidia driver. • Added support for EthereumStratum/2.0.0 protocol (use -proto 5 if the pool requires it). • Increased the maximum supported DAG epoch to 329. This should be fine for at least a year or so. • Added support for direct mining without DAG switching of Yocoin (YOC), Bitcoiin2Gen (B2G), Ethersocial (ESN), Atheios (ATH), and REOSC. See the -coin parameter in Readme.txt for more information. • Other small improvements and fixes.